I’m in the midst of decorating my office – a modest, but charming stone garden shed with a slate tile roof. Inside there is a wood burning stove and just enough room for a beautiful mid century rosewood desk that was a moving-to-England present from my husband, a credenza and a two-seater sofa. I’m going to hang all my old Hugo Guinness show announcements from John Derian on the walls, and I’ll cover one whole wall with tear sheets, photos and other bits and pieces of creative fuel. I desperately need a rug and a colorful thing or two (a pillow, a lamp) as its all looking a bit too neutral so far. In my search for office inspiration I came up with some great pics. These are my favorites, and soon I’ll show you the results. I love Aerin Lauder’s all white walls and cabinetry mixed with the graphic floral, the vintage-y looking lamp and all the bits of inspiration arranged in such an orderly way. While I love appreciating other people’s creative chaos, I am girl who loves creative order. Aerin’s conference room reminds me of how color can come from stuff – flowers, books, postcards, photos – and how chic it all looks with a simple background. Also, it points out that when you are working in monochrome, texture is everything! DVF’s office from the 70’s is amazing, but it doesn’t like she got much work done on that immaculate desk. Don’t you wish you could see the photos on her corkboard a little closer? DVF’s office today. I have spent many hours sitting in one of those chairs chatting to Diane while she types at her computer, illustrates a card or takes notes. My favorite part of her office is the column of photos of friends and family behind her desk. She also has incredible art, and I like how casually it’s just leaning against the windows. This is where Diane eats lunch. I think it’s very civilized to have a place in your office to eat that is separate from your desk. Maybe I’ll have a little table in front of my sofa to eat lunch on. I like to eat in my office but there’s something depressing about eating in front of your computer screen. Landscape designer Miranda Brooks recently moved her office to the carriage house behind her brownstone in Brooklyn – the same one I talked about in my recent post and that was also featured in January Vogue. 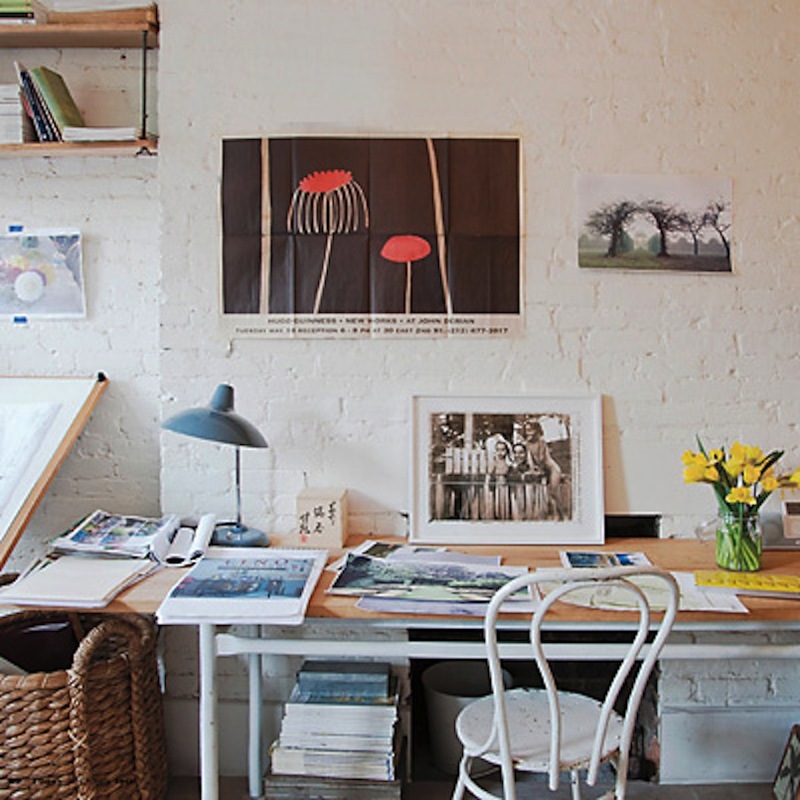 This is Miranda’s old office, shot for Heather Clawson’s brilliant new book Creativity at Work. I love the French industrial furniture and lamps mixed with the cozy rug. Photo by Heather Clawson. Miranda has a great knack for mixing warm (wicker, wood) with cold (metal, glass). Photo by Heather Clawson. This is Miranda’s new office. For me, the more an office feels like a home, the better. I like to be cozy and comfortable when I work. Reed Krakoff has the most amazing collection of uber-sophisticated furniture, art and objects in his office. When I first visited him there, I never sat down. We just chatted while I wandered around the room inspecting all the things that were grabbing my attention. I love the contrasting informality of the piles of books just laying around on the floor. Have you ever noticed that books are chic no matter where they are or how they’re arranged? I have always loved Emanuele Della Valle’s blue folders customized with his initials. This photo of his desk, posted by him on Instagram, put me over the edge. I have to get folders like his. Anh Duong in her painting studio in East Hampton. Anh has amazing eye for creating great architecture (those windows!) and filling it with a brilliant combo of both simple (the rug above, the chair below) and over-the-top (the mirror below) things. Jenna Lyon’s office has been photographed a kajillion times. For real. 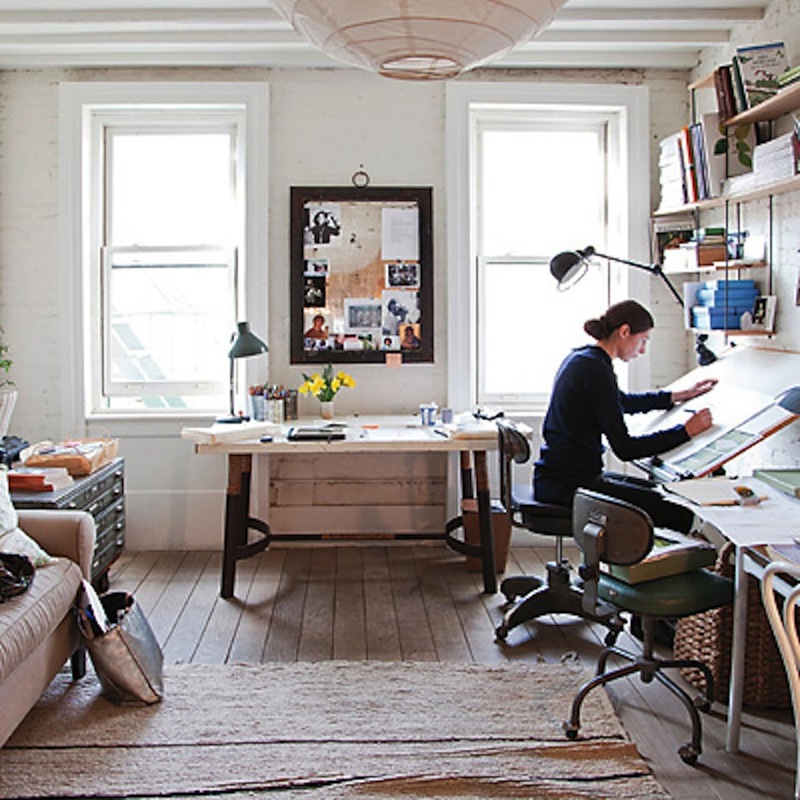 Google “Jenna Lyons office” and you’ll see what I mean. Of course there is a good reason – it’s gorgeous! And so is Jenna. But this photo especially does it for me. It’s so Juergen Teller – feminine yet subversive. Brilliant. Jenna’s office would be in almost too perfect mid-century good taste were it not for the inspired watermelon-colored desk and the mismatched chairs which make it personal, quirky and relatable. Photo by Heather Clawson. love your idea of converting your garden shed into an office. a word of advise from someone who did the same thing many years ago. i put all my artwork, drawings, books and fabric into a room off of our garage in the back of our garden. the walls were not insulated and everything got very moldy after a period of time, i had to throw out everything. so be careful please!